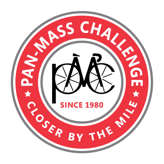 This is the 34th annual PMC, and our 14th PMC. In spite of various challenges and complexities in our lives and the world in general, we remain committed to this exceptional cause and we ask for your support. The Dana-Farber Cancer Institute is one of America’s finest cancer research and care centers (repeatedly ranked in the top 5 by US News and World Report for cancer care, and four-star ranked by Charity Navigator for its efficiency with your contributions), and your gift allows Dana-Farber to do leading work in the field. This year Carl rode from Stockbridge starting on the Friday morning, and David joined him in Sturbridge for the Saturday and Sunday regular PMC of 190 miles. We are riding with renewed vigor this year in memory of Carl’s mom Sandy Howerton, who was taken by cardiac amyloidosis late in 2012. Sandy drove the support van for two weeks of our epic 2006 transcontinental ride, and with Carl’s dad Pete was a reliable volunteer presence at the Nickerson State Park waterstop on PMC Sunday morning. With the support of our generous donors, over the past 13 years we’ve raised over $400,000 for the Dana-Farber Cancer Institute’s Jimmy Fund. - 2008: Mike joined us for a successful, two-day Challenge. - 2005: we rode a bit more than the official PMC route, clocking 215 miles and adding CT to our list of states ridden. - 2004: in celebration of the historic 25th annual PMC, we rode from David’s then-hometown of Cincinnati to join the PMC - a total of 1,054 miles over 11 days! (And no, you don’t want to know about the saddle sores). - 2003, 2002: we rode about 300 miles by adding an extra day and 100 miles, starting from the MA/NY state line. 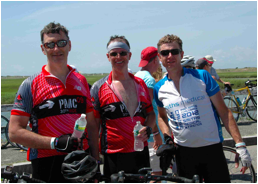 - 2001, 2000: we rode the official PMC route, 192 miles from Sturbridge MA to Provincetown MA over two days.